HF: As demonstrated below Hang Tai & Fungs Company Ltd were the Hong Kong agents for several well known products. I don’t know when the company operated from and to. 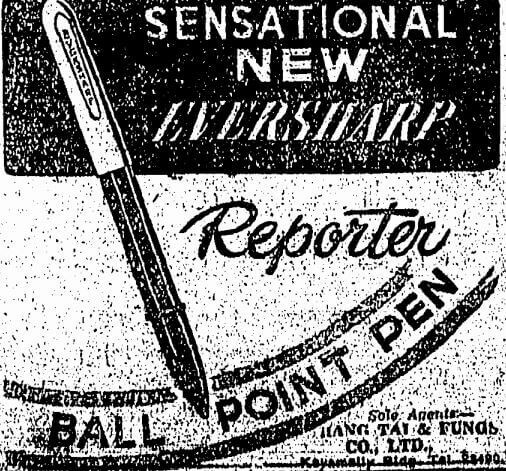 However, the very similarly named, Hung Tai & Fung (Tobacco) Company Ltd, was formed on 20th November 1952 and dissolved on 30th December 1994. Further information about either company would be welcome. This article was first posted on 27h September 2017. Hang Tai & Fungs (雄德公司) was incorporated in 1948 and dissolved in 1988. 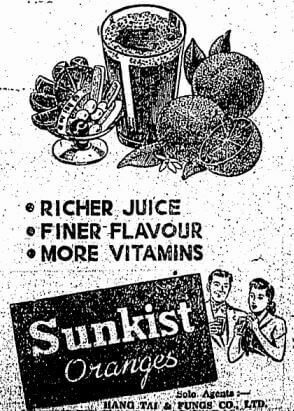 There were Chinese advertisements of the firm pitching Sunkist oranges in 1940 so it probably was founded earlier. Its proprietor was Fung Kung-ha (馮公夏, 1903-2000), whose picture and profile you can find at below link. Fung was a Buddhist leader and one of the first yoga practitioners in HK.